Actress and Goya product endorser Kim Chiu showed once again her big, charitable heart and that she is not all about glitter and glamour amid her whirlwind showbiz life. As part of her 22nd birthday celebration, Kim prepared a party for the less-fortunate kids from a foundation caring for indigent children, where she gave away special gifts and products from those that she currently endorses, including Goya. Aside from the numerous gifts, Kim found time from her busy schedule to prepare a special song number just for the kids, who were all amazed and starstruck at the same time seeing their idol bring joy and have fun with them. 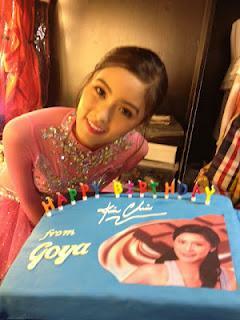 And capping off her birthday celebration this year, Goya again gave Kim a Goya cake with a special design inspired by Goya’s packaging, during the young actress’ birthday celebration at popular Sunday noontime show ASAP. Photos show Kim with the kids and posing beside her special Goya cake.